If you want your feet to finally relax, Notton is your brand, because pay special attention to the comfort in your designs, this sport style ankle boots will get your feet to feel a comfort without equal. By buying this product you can collect up to 576 loyalty points. Your cart will total 576 points that can be converted into a voucher of 4,61 €. 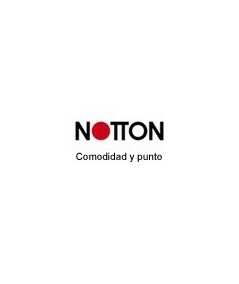 At Notton, working every day to create more comfortable footwear, thinking on your feet more delicate we offer this model width 14, to get wider feet can wear a stylish sport and casual, without having to worry about foot pain. This model is available in two essential colours. -Leather, a tone that recalls the color of the leaves in autumn, perfect to combine with the more informal looks. Foreign manufacture of the loot is whole soft skin of beef, with a very natural and comfortable look. Lining textile upholstery, an extreme and very warm softness for days more cold of winter. The template is anatomic and removable, so you can change it if you are using custom templates. The restraint system is double Velcro, with metal button on upper velcro motif. It has the rounded toe, width 14, allowing for an extremely comfortable fit. With rubber floor ribbed to avoid slips and sewn entirely to the skin of the shoe. The crib is made of rubber and has a height of 3.5 cm and a 1.5 cm platform. Manufactured and designed in Spain by Notton. Notton offers us a collection of very wide ankle boots, with removable insoles, which makes them a great alternative when we use custom templates. Everything with designs intended for an active woman, who like walk way light and flexible, with a shoe that can be used throughout the day in various situations. Se ve que son de piel de calidad y muy cómodos. Vienen con plantillas. Hace varios días busco sin encontrar todas las necesidades que necesita un pie delicado, al mismo tiempo que no deseaba descartar la estética del mismo y, lo encontré en CALZADOSROSI. Espero se adapten a mis pies. Gracias.